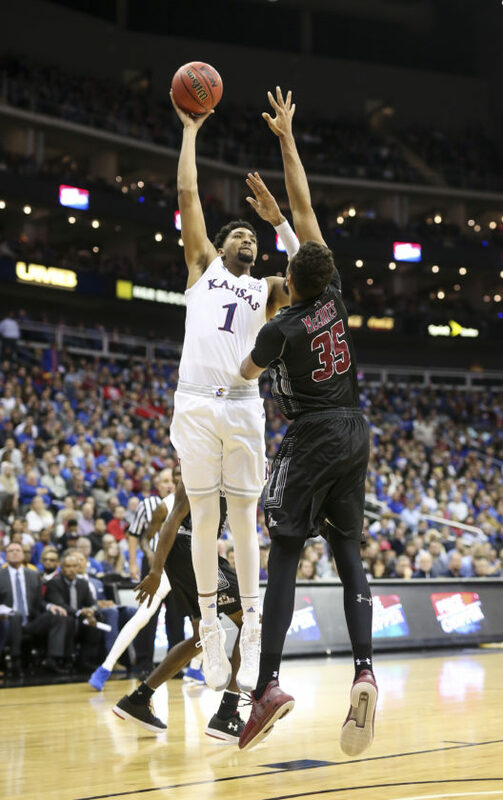 Kansas forward Dedric Lawson (1) turns for a shot over New Mexico State forward Johnny McCants (35) during the second half on Saturday, Dec. 8, 2018 at Sprint Center. Kansas City, Mo. 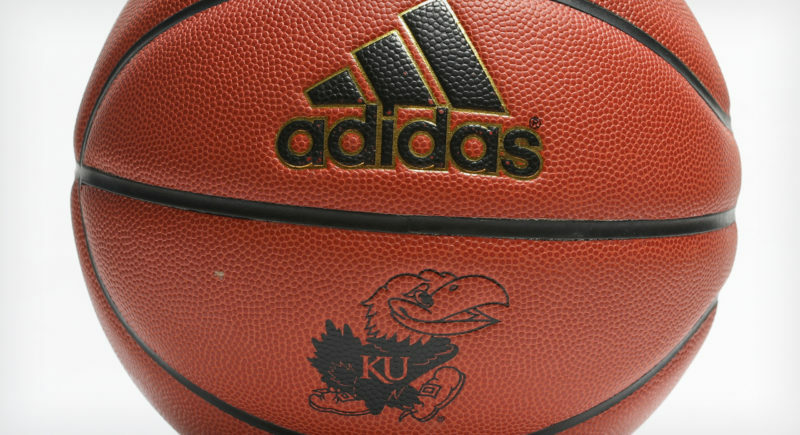 — The play call was simple enough, and it wound up saving Kansas during a 63-60, grind-it-out victory over New Mexico State on Saturday night. “Five side” is the name of the inbounds play underneath the basket, and it is designed to get junior forward Dedric Lawson a shot in the paint. With a guard in each corner, Lawson on the block away from the ball and KU forward Mitch Lightfoot standing across from him, Lawson ducked in behind Lightfoot’s flash to the high post and caught the ball with nothing but space around him. 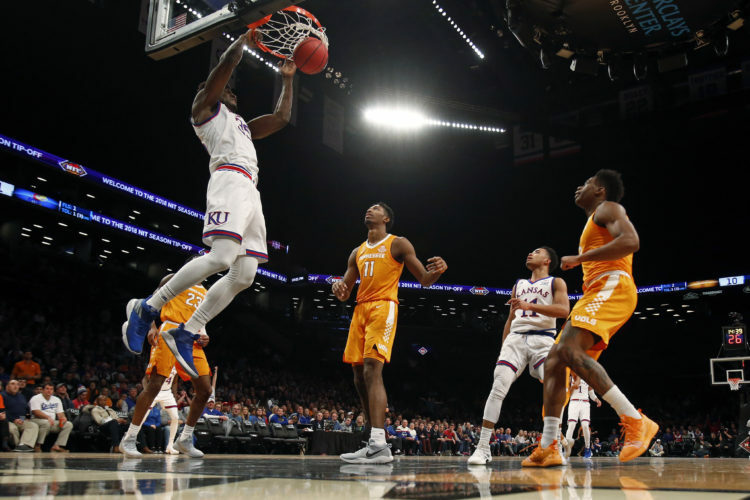 The easy hook pulled Kansas within 5 and sparked a spectacular finish from Lawson, who exploded from there to score KU’s final 14 points en route to his fifth double-double (20 points, 10 rebounds) of the season. After the game, Lawson credited the inbounds play for getting him going, but said “just seeing the ball go through the net” was more important than anything specific about the action. Lawson’s soft hook was followed by a 3-pointer from senior guard Lagerald Vick that brought some energy into the building and pulled the Jayhawks within 2 with 8:51 to play. Lawson assisted on the shot and then took over from there. The next 14 points were all his — four layups, three free throws and a 3-pointer, just his second of the season. The Memphis transfer with good range is now 2 of 13 on the year from 3-point range. And that second make came with Saturday’s game knotted at 57. Kansas never again trailed after taking the 60-57 lead, and the Jayhawks walked away victorious, perhaps feeling a bit lucky, when a 3-pointer to tie it from NMSU’s JoJo Zamora missed the mark. 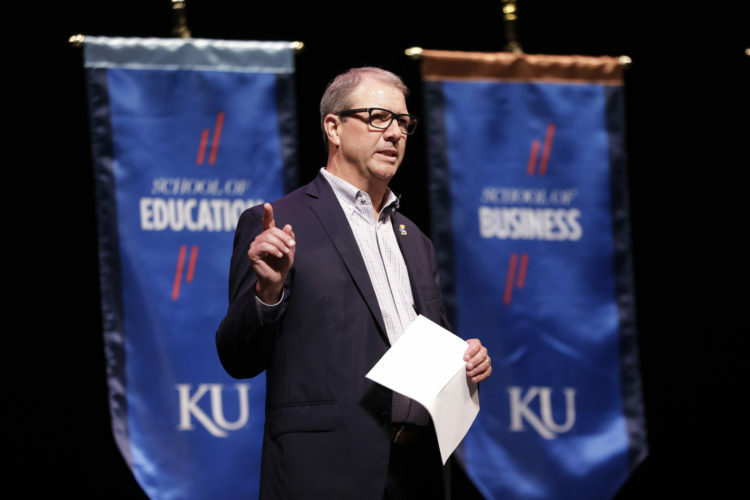 Early on, it looked as if the Jayhawks would travel down a much different path to reach their desired destination. After sprinting out to a 12-2 lead during the game’s opening minutes — a start that, for the second game in a row, did not include Vick in the lineup — second-ranked Kansas struggled to find that rhythm that Lawson spoke of until the stretch run. Players of all shapes and sizes made mistakes or suffered mental lapses that allowed New Mexico State (7-2) to gain confidence and play with the upper hand. The Jayhawks (8-0) led for less than half of Saturday’s contest and might not even have been that fortunate if not for Lawson’s big finish and Lightfoot keeping them alive. Sure, a handful of other Kansas players had key shots or memorable moments that helped save the Jayhawks, but few came from the same kind of effort and competitive energy that Lightfoot brought to the table during his 18 minutes that produced 7 points, six rebounds and a few key momentum swings. Self saw Lightfoot’s night from a slightly different perspective. And, remember, this is a coach who rarely looks at total points as the defining factor in whether one of his players played well or not. Lightfoot’s energy was up and his effort was good. His charges and momentum dunks provided a big lift, as well. But, as Self pointed out, he still allowed his man to score too easily in the post and was one of those Jayhawks who allowed a mental lapse to hurt the team. The Jayhawks may have survived it, but Self was in no mood to celebrate it after the victory. Lawson was down the stretch — much like Vick was to close out the Stanford game — and Kansas moves on as one of college basketball’s remaining unbeatens. So, yeah; Self and the Jayhawks will take it. But the key to this team getting better than they were Saturday night against New Mexico State is in the collective act of individual improvement. That goes for Lawson, too. “I guess when you play enough and shoot enough, the law of percentages will prevail,” Self joked of Lawson’s 8-of-15 shooting effort in 31 minutes. “He made some good plays late. But it’s hard to get too excited when, other than (against) Vermont, that’s about as poor as he can play. 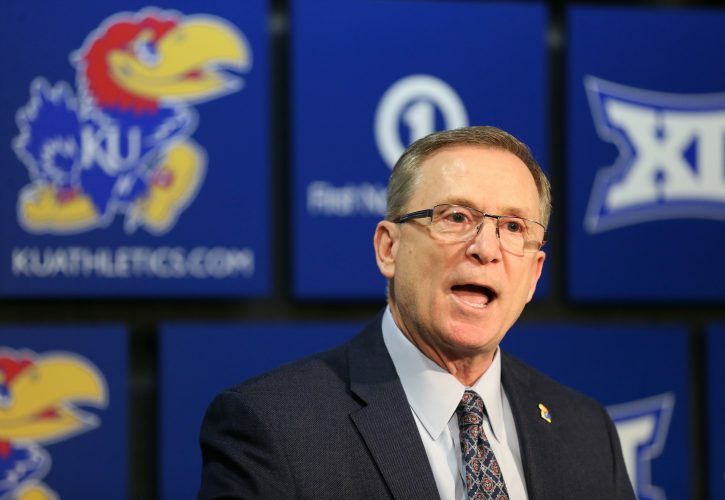 Kansas is off next week and will return to action Saturday, when Villanova comes to Allen Fieldhouse for a highly anticipated rematch of last season’s Final Four clash.